Our Project Pyramid Teams in Greece worked with the organization Welcommon, tackling two different aspects of this business. Check out what their projects looked like, and what they learned from their experiences. Over Spring break we traveled as a group of 8 students to Athens, Greece. We represented two different consulting project both with WELCOMMON Hostel. Team A comprised of students from different backgrounds, studying different graduate disciplines – MBA, economics, higher education policy and leadership and organizational performance (Benjamin, Shatakshi, Tiffany and Zahraa), and worked on the Social Programming side of the project. 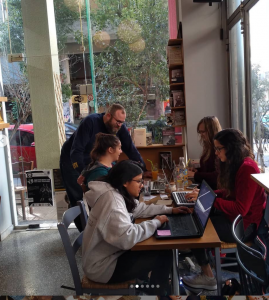 Benjamin, Tiffany and Shatakshi were on the ground 3rd – 8th of March, 2019 in Athens, Greece meeting and conducting interviews with WELCOMMON, their social program volunteers, and other key stakeholders. Meanwhile, Zahraa was doing similar research on social programming and social enterprise hostels while in Guatemala. The main objective for our team was to witness the working of the social enterprise, and researching how to implement sustainable best practices for our client’s social programs. Overall, this course and project afforded our team the unique opportunity to work on an interdisciplinary graduate level consulting team and have tangible real–world experience working alongside a social enterprise. Immersive, experiential learning opportunities like this one combines well with traditional classroom education to create a rich growth experience. Project Pyramid students Ermias Berhe (MBA ‘20), Becca Huppi (M.Ed. 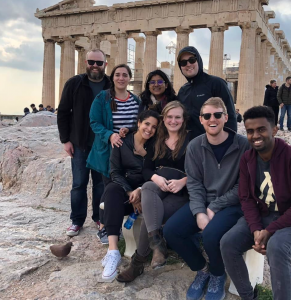 ‘20), Taylor Matherly (M.Ed.-M.P.H.’19), and Mike Stephan (MBA ‘20) spent the first week of March on site in Athens, Greece with their partner organization Welcommon. This organization is dedicated to serving refugees and unemployed Greeks through its various social programs. With the United Nations’ recent decision to cut back funding to Greece, Welcommon found itself without the means to support the social programming core to its mission and made the decision to convert the five floors previously dedicated to housing recently arrived refugees to income-generating hostel dorms. The students spent their week gaining an understanding of context through staying at the hostel as guests, attending social programming, meeting one-on-one with Welcommon directors and staff members, holding open discussions with volunteers, networking with Athens-based co-ops serving refugees, and visiting competitor hostels in the area. With a plan of action co-developed by the students and Welcommon, the students will dedicate the rest of the semester to producing meaningful deliverables for Welcommon with the end goal of increasing income from the hostel operations in order to support social programs. Specifically, team members will be working with Welcommon to create meaningful partnerships with cooperatives in the United States and to create a marketing plan that highlights Welcommon’s distinct mission to attract like-minded guests.